The ministry of Jesus followed a wilderness journey. His forerunner was John the Baptist. John proclaimed that the Kingdom of God was near, and that a path for its coming Messiah should be prepared in the wilderness (see Isa 40:3; Mat 3:3; Mark 1:3; Luk 3:4-5). John also taught that God’s Kingdom was exclusive only to individuals who repented and made themselves ready for its arrival. All others, he said, would face a soon coming, fiery judgment. This verdict came against that same generation during the 70-73 AD destruction of Jerusalem. (15) And was there until the death of Herod: that it might be fulfilled which was spoken of the Lord by the prophet, saying, OUT OF EGYPT HAVE I CALLED MY SON. (1) WHEN ISRAEL WAS A CHILD, then I loved him, and CALLED MY SON OUT OF EGYPT. (6) Having yet therefore ONE SON, his wellbeloved, he sent him also last unto them, saying, They will reverence my son. (7) But those husbandmen said among themselves, THIS IS THE HEIR; come, let us kill him, and the inheritance shall be ours. (8 ) And they took him, and killed him, and cast him out of the vineyard. (9) What shall therefore the lord of the vineyard do? HE WILL COME AND DESTROY THE HUSBANDMEN, AND WILL GIVE THE VINEYARD UNTO OTHERS. These verses interrelate together showing that the Promised Child was and is Jesus Christ! He is the same promise Paul referred to allegorically in Galatians 3:16 as the One promised SEED of Abraham. Through Jesus, we become partakers of that same promise. Neither the ethnicity of the Jews nor their opportunity to receive salvation through Jesus ended because of the 70 AD destruction. But with this destruction came the elimination of the self-righteous system of Law keeping to which the Jews had fallen prey. Jesus’ coming in judgment during that generation – as prophesied – firmly established Him as the King of kings and the Lord of lords who does RULE AS GOD! The Law system being destroyed in 70 AD, decisively made Jesus’ New Covenant the everlasting covenant for mankind. This meant that Jesus’ plan of salvation is the only way whereby men become part of the true Israel of God! THIS IS NOT A REPLACEMENT OF PHYSICAL ISRAEL, BUT A TRANSLATION OF THEM TOGETHER WITH SAMARITANS AND GENTILES INTO WHAT THE BIBLE CALLS “THE CHURCH,” “THE BODY OF CHRIST,” “THE ISRAEL OF GOD,” AND “THE NEW JERUSALEM” (see Mat 23:4; Act 2:36-39, Act 1:8; Act 15:10; Rom 1:16, Rom 10:12; Gal 3:28, Gal 2:4, Gal 4:9, Gal 5:1, Gal 6:16; Col 2:16-22, Col 3:11; Eph 2:15, Eph 3:3-10; Heb 9:8-11; Rev 3:21, Rev 21:2). 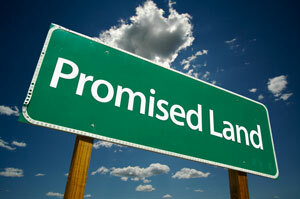 God’s fulfilled Promise was much larger than the physical borders found in the Old Testament. In the New Covenant, God broadened the Promised Land’s borders to embrace the entire world. Paul clearly explains that the true children of Abraham can never come through the Law but only through faith in Jesus Christ. He said it was impossible for fleshly descendants to fulfill Abraham’s promise, for if they could, then they would nullify the work of Jesus. Paul is showing us that God’s promise to Abraham (“I have made thee a father of many nations”), was to also include the Gentiles. (16) Now to Abraham and his seed were the promises made. He saith not, And to seeds, as of many; but AS OF ONE, And TO THY SEED, WHICH IS CHRIST. Through passages like these we see that Jesus is the only true and legitimate Heir of the promises to Abraham. Through Him, the scriptures show, the members of His body (the Church) are included in this same promise. (6) Even as Abraham believed God, and it was accounted to him for righteousness. (7) Know ye therefore that THEY WHICH ARE OF FAITH, THE SAME ARE THE CHILDREN OF ABRAHAM. (29) And IF YE BE CHRIST’S, THEN ARE YE ABRAHAM’S SEED, AND HEIRS ACCORDING TO THE PROMISE. These define what Paul meant by “the election hath obtained it,” for they show “they which are of faith,” are the remnant of Israel. Together, this remnant and the believing Gentiles make up the “body of Christ” (see Rom 11:17; Gal 3:9; Eph 3:6). (3) And said unto me, THOU ART MY SERVANT, O ISRAEL, IN WHOM I WILL BE GLORIFIED. It was Jesus’ finished work is what brought glory to God. Remember what Stephen saw as he was being martyred: “But he, being full of the Holy Ghost, looked up stedfastly into heaven, and saw the glory of God, and Jesus standing [standing—”abiding in the covenant” –Strong’s G2476] on the right hand [right hand—position of power] of God” (Act 7:55). Stephen seeing Jesus still firmly in possession of all power in Heaven and in earth is why he showed only God’s peace while being martyred. This visual testimony of Jesus’ power caused Stephen’s face to glow like an angel before those who murdered him. Stephen’s story is a great example of how Jesus’ fulfilled promises affected the early Church. These believers saw themselves as those who had come through the wilderness of sin and had entered the glorious Promised Land of Jesus Christ! This empowering truth of the everlasting gospel solidified them as the body of Christ, thereby driving them forward to go and spiritually change their world with the Truth of Jesus Christ (see Act 4:13; Act 17:6). Copyright © 2004 TK Burk. All Rights Reserved.